The world set to music. Some spots are flowing and harmonious while others are brash and discordant, reflecting the reality of our world. I have placed a few hidden elements into this work that map enthusiasts are quick to identify. I placed North America in the center because I was living in Austin, Texas at the time and I wanted to have it appear as the center of the musical world. This piece is scored for 37 instruments and the music is the complete transcription of what you see. 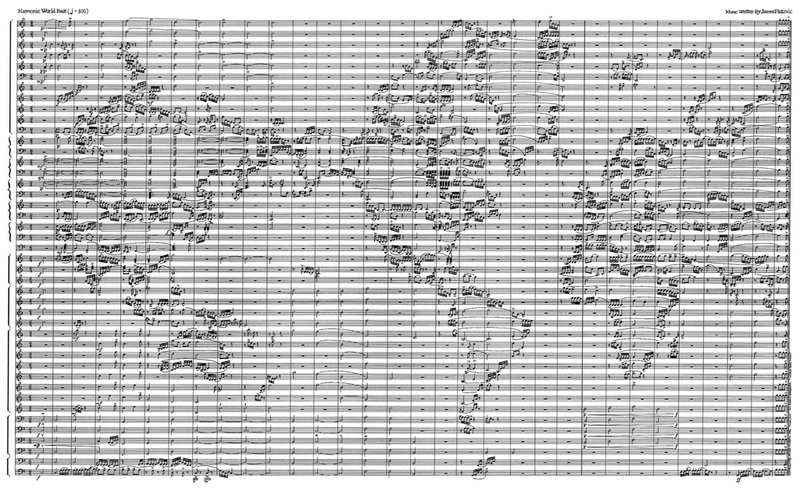 This work has been very popular and has been featured in numerous publications including Frank Jacobs' "Strange Maps" and as the cover art of Mark Hijleh's "Toward a Global Culture of Music." It is also my favorite work to date. 24" x 36" prints of this work are available.